This is just a quick overview of the areas that may be fished during a charter. Magnificent places to visit and teaming with great fish. You will remember a fishing charter to one or more of these prime locations. 2+kilo bream are not uncommon. Peak fishing times October through to May. SCAMANDER RIVER - is 15 minutes south of St.Helens. An all year round fishery, the bream are found in different parts of the river depending on weather conditions and time of year. It is a very consistent fishery and good for sight fishing. A special bonus of the river is the presence of sea running trout. 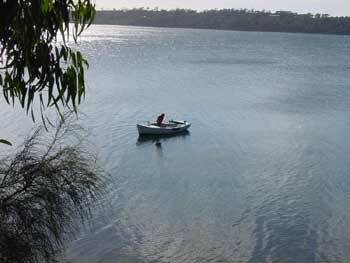 SWAN RIVER - 1.5 hours south of St Helens at Swansea trophy bream can be caught. It is an excellent shallow water sportsfishing location. beautiful tranquil river but a good trout fishing water. Gone fishing charters has private access to fantastic stretches of this water which holds good fish. Enjoy the scenery whilst wading this river. of fish species (bream, mullet, garfish, squid, Australian Salmon, Flathead, Taylor, Trevally, Leatherjac ket, Kingfish & Sweep) Half and full day charters are available for bay tours. Enjoy the sport and catch yourself a feed. Great variety of species and a variety of fishing techniques can be used to ensure a memorable and exciting day. Try Australian Salmon on a fly, one of natures great fighters with equal fighting power per pound to any fish. 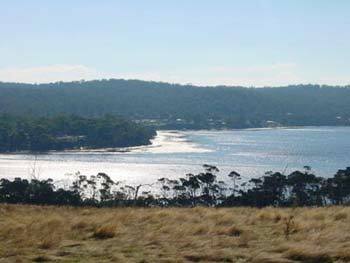 Anson Bay - North of St.Helens is one of the major Trophy Bream Fisheries on the East Coast. 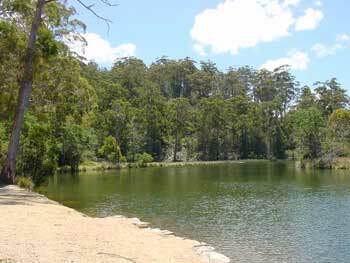 camping spot and a great bream fishing spot. Beauty Bay is part of the larger Georges Bay. The town of St.Helens surrounds the bay. A major breeding area for a huge variety of fish.